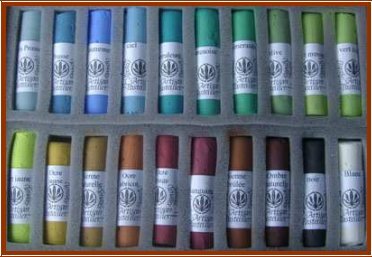 Narrative: Normally the posts on this blog are confined to artists' websites; but occasionally a related matter is included, and I want to draw your attention to a small pastel manufacturer in the town of Albi in the south of France. 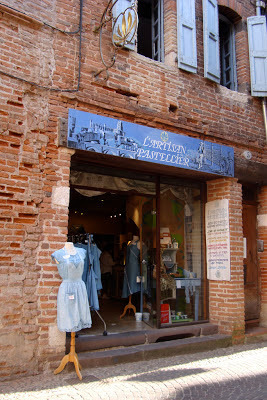 Didier Boinnard's shop is in the historic centre of the city, at 5 Rue Puech Berenguier. His products are based on vegetable dyes, including Isatis tinctoria - woad, that give its name in French to the region "le pays de Cocagne" on which I have blogged in an earlier post. This little shop also sells clothing, accessories and so on dyed with woad. The web page is an eye-watering layout of desirable pastels, in little packets of four for €13.90 to €15.00 depending on the colour range; one can of course buy larger sets of 10, 20, 40, or indeed the complete range of 60 colours. The sets are also available as portrait or landscape selections - I especially like the latter, as it is produced in France with the local landscape firmly in mind. The catalogue is available as a pdf download and the pastels are available via mail order on line. L’Artisan Pastellier est une petite entreprise composée de trois personnes. Jean-Rémi Hot et Didier Boinnard, artisans pastelliers fabriquent et teintent artisanalement dans l’atelier graulhetois «pays de cocagne». Cathy Jacob s’occupe quant à elle de commercialiser les produits dans une boutique nichée au cœur du vieil Alby. Disponibles en coffrets de 4, 10 ou 20 pastels ou en coffret de 40 couleurs assorties. Pero tal vez no fuera un lugar tan fantastico… El nobre, que deriva del francés Pays de Cocagne, hace referencia a la cocagne, la bola que se hacia con las hojas de la planta del pastel, de donde después se extraia el preciado pigmento azul. Cuanto mas tiempo se dejaban secar, mejor era la calidad del mismo. Por eso una expresion de la época decia que « Al Pais de Cocanha, qual lo mai dorm, aquel mai ganha ! », decir , « En el Pais de Cucaña, cuanto mas se duerme, mas se gana ! ». De ahi el mito de un lugar en el que no habia que esforzarse mucho para tener la que se deseara o ser feliz. Matthew Rezac has been winning awards for his pastels since 2004, including several Honorable Mentions in the Pastel 100 and and 1st place in the Still Life category in 2007. He was featured in Best of Worldwide Charcoal, Pastel, and Pencil Artists, Volume I, Kennedy Publishing, 2009. An image of his painting "Cultivator" was selected for Stored Potential, a mural project in Omaha, Nebraska featuring fifteen 80' x 20' banners displayed on the side of a vacated grain elevator. Subjects: Rezac says: "My work is about home, the kind that is shared across generations. A place built by a family, torn back down, revised, nurtured, and well known. A place where memories are stored in everyday objects, waiting to be happened upon and revived, bearing the mark of grief and love and hard work and orneriness and tenderness. A place that quietly forms you as much as you form it." Navigation: Links remain available at side of page. Image View: Thumbnails open in a Flash viewer and may be scrolled. Only the title is provided on mouseover. Download is not possible without using Prt Sc. Blog: Included as part of the website. Bio: Rebecca Margolese-Malin of Chapel Hill, North Carolina, gradated with a B.A. in Art History from UC Berkeley and an M.A. in Art History from UC Santa Barbara. When she moved to North Carolina a meeting with Lindesay Harkness turned into a student/teacher relationship that inspired Rebecca to open her own atelier where she teaches the techniques learned from Harkness which can be traced back to members of the Boston School of American Impressionism and earlier. Rebecca has been showing her work and winning awards since 199, including an Honorary Mention in the 2010 Pastel 100. She is a member of the Pastel Society of North Carolina. Navigation: Website seems not to have been updated since 2007. Links remain available at bottom of page. Image View: Thumbnails open in an on-page viewer. Size is given. Some few may be further enlarged, or the detail viewed. Fruit and Green Pitcher is 25 x 19.5 ins. Bio: French artist Jean-Claude Muret was born in 1946 in Nanterre, and since 1980 has lived on the banks of the Loire at Ancenis. He is self-taught, although he spent his career in the graphic arts, then many years head of a communications group. He started painting in 1970, at first oil and ink techniques and Chinese washes and exhibited frequently from 1990 to 1995 ... he also won a 1st in 1995 awarded by the Lions Club for an oil painting. 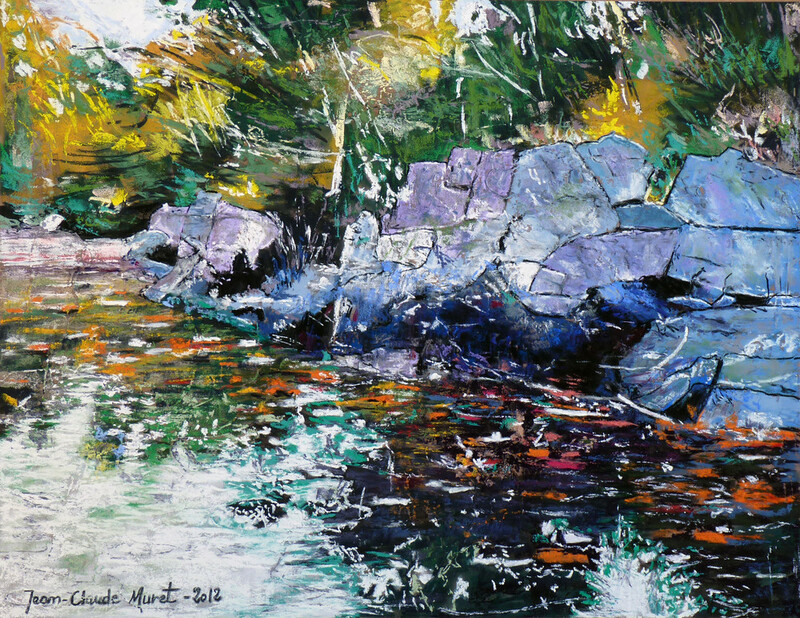 He discovered pastel in 1993, thanks to a gift of a small wooden box of Girault pastels and was immediately smitten by the direct technique. He took up the batons again in 2009 and hasn’t looked back since. What he likes about pastel is its spontaneity. But he says that it is a demanding technique because it requires an ability to draw well. Jean-Claude is a member of Art de Pastel en France and was selected to present his paintings in the International Exhibition in Giverny in 2012, when he was awarded the Special Jury Prize awarded by the Pastel Society of America. He has also been the recipient of the British Pastel Society’s Prize for Originality and the Prix de Pastel en Yvelines in 2012 . Medium: Pastel. Jean-Claude likes to explore the availability of artisan pastels and has had some made to order by Pip Seymour. He also mentions Terry Ludwig (his clear favourite), l'Artisan Pastellier (Albi) and Terre de Gaude. Subjects: Landscape, often expressed in close-up. Navigation: Links remain available at left of page. Easy to access galleries. Image View: Thumbnails open in an on-page viewer. Size is given. Download is permitted. Amont aux Roches du Diable is 65 x 50 cm, 1000 x 772, 440 KB. Bio: Stan Sperlak was born in Denver, Colorado in 1960. He attended the Pennsylvania Academy of the Fine Arts during 1995-1998 studying with Al Gury, Jill Rupinski, Maggie Gilboy and others. During 1998-99, Sperlak studied in the home and garden of artist and landscape architect William Frederick. Sperlak also studied from 1997-2003 with Patricia Vanaman Witt, founder of the Barn Studio of Art in Millville, New Jersey, focusing on plein air landscape painting. In 1997 Sperlak bought 37 acres of farmland, forest and marsh along the Crow Creek in Goshen, NJ and started work on a studio and future teaching facility. In 2003 with the encouragement of Pat Witt, Sperlak embarked on continuing Witt's traditions of plein air teachings and style. Crow Creek Farm is now the main facility for his classes. Sperlak has also taught in Maine, Colorado, South Carolina, Pennsylvania and Maryland, and has been invited to teach and speak at art centers across the US. In 1998 Sperlak started to exhibit professionally. He is currently represented by SOMA Gallery in Cape May, NJ, William Ris Gallery in Stone Harbor, NJ, Main Line Art in Philadelphia Pennsylvania, Hardcastle Gallery in Wilmington, Delaware, Main Street Gallery in Annapolis, Maryland, Laura Craig Galleries, Scranton PA and Bishop’s Stock Gallery in Snow Hill, MD. His works are also in the permanent collection of the Noyes Museum in Oceanville, NJ. Sperlak is a signature member of the Pastel Society of America, the Maryland Pastel Society and a member of the Pastel Society of Colorado. He is also a member of the Mid Atlantic Plein Air Painters Association, having served on the Board of Directors since 2005. 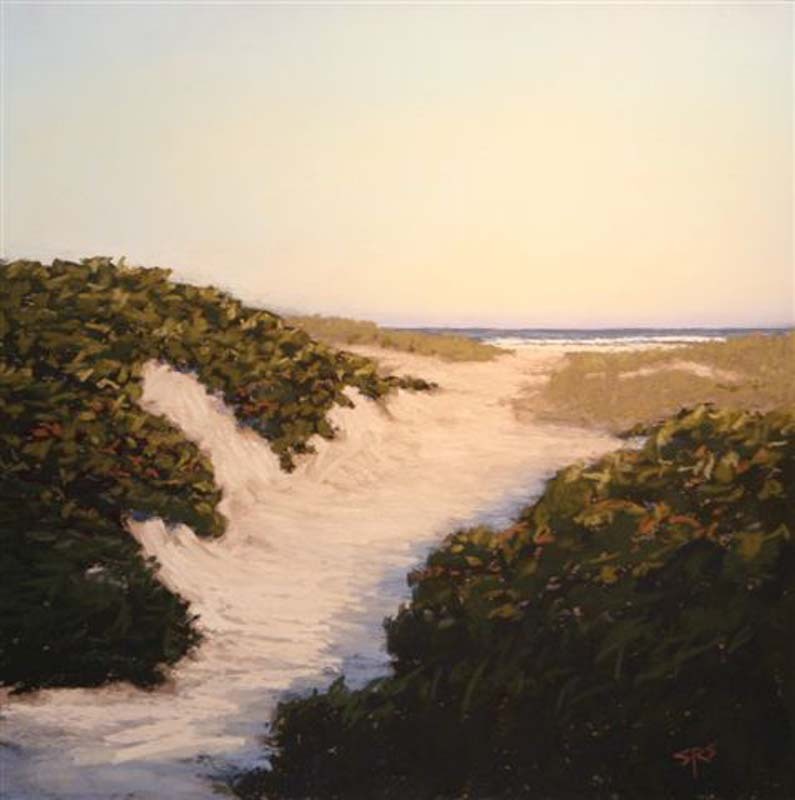 He is a member and past President of The Cape May County Art League. Medium: Pastel. Witt and Sperlak's tradition teaches that painting outdoors should be an exercise in "note taking" with color and gesture from life, to capture the light and essence of a place, and to establish the basis for future works from these studies. Subjects: Landscape. Figurative. Sperlak's most recent paintings limn the landscape of the Mid Atlantic region of the USA. Shorelines, marshes, fields, skies, boats, fisherman and night scenes are all grist to his mill. He lists his strongest influences as Robert Henri, George Inness, William Lathrop and N.C. Wyeth. Publications: BlueRoads Magazine featured Stan in the October 2005 issue. There is more to be found on his Press page. 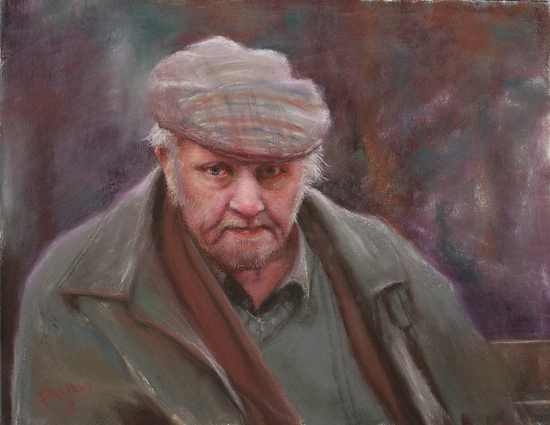 Technique/Style: Stan’s intensely pigmented work is the result of using handmade pastels on rough and smooth papers and on self-prepared boards. Many of the passages are accomplished with a very light blending by hand, while some of the heavier tones are built through layers of pastel that are sometimes liquefied and “fixed” with water, alcohol and turpentine applied with brushes, razors, spoons and rags. Navigation: Website by WuLi. There are menus within menus, but navigation is a logical progression. It is easy to find what you want. Gallery: Paintings – Selected works. Image View: Thumbnails provide information on painting on mouseover. They enlarge on a new page, where you can scroll back, forward, or return to thumbnail page. Download is permitted. Dune Trail is 12 ins square, 795 x 800, 42 KB. Bio: As Marie-Elise Larène was growing up, it was as natural for her to draw or paint as to eat or sleep. Her father was a sculptor of sacred art and also drew very well. At 9 years old she knew art would be her only true vocation. At 16, in 1971-1972 she attended a visual arts workshop in Atelier du mai, Malakoff. From 1972-1975 she studied at the Beaux Arts in Paris, where she claims to have learned nothing and at 20, she began working full time, turning her hand to everything - watercolors, scenes of ordinary life, interiors – she even spent some years dedicated to embroidery. And then one day, at age 32, she walked into an art supply shop and bought a box of quality pastels. That was April 1, 1987. In the months that followed she painted 50 pastels and in September held her first exhibition. The rest is history. The artist was featured in the June 2010 issue of Pratique des Arts. Marie-Elise Larène lives in Meudon, 92190. Subjects: Landscape where skies loom large. Navigation: This website is in French. Links remain available at side of page. Gallery: Pastels: Moyens Formats (average size) ; Grands formats (large size – over a metre high and wide) ; Tondi (round format) ; Paravents (screens). Note: Marie-Elise uses the Tondo because she finds it acts as an objective lens to "zoom" into a subject and focus the viewer's interest. The round frame circumscribes the painting without a break-point. In Chinese cosmology, the sky is round, whereas the earth is square. The round is the perfect format. Image View: Thumbnails at the side open in a Flash viewer and may be viewed singly or scrolled. Information on title, medium, and dimension is provided. There is a right-click option that offers “download image” but I only got an unknown file type that would not open in an image viewer. However, when I changed the file name so that it ended in “.jpg” (note the full stop) it worked a treat. So if you wish to download an image, save it as “whatever.jpg” and it should work. 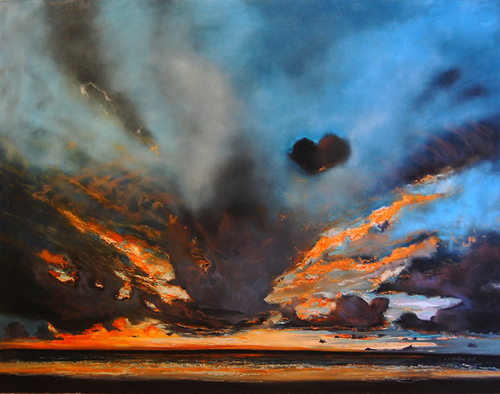 Coup de foudre is 120 x 160 cm, 500 x 394, 144 KB. Demo: This is the short video on her home page. Bio: Adrian Giuliani always knew she was an artist. Growing up, Adrian was constantly creating artwork. 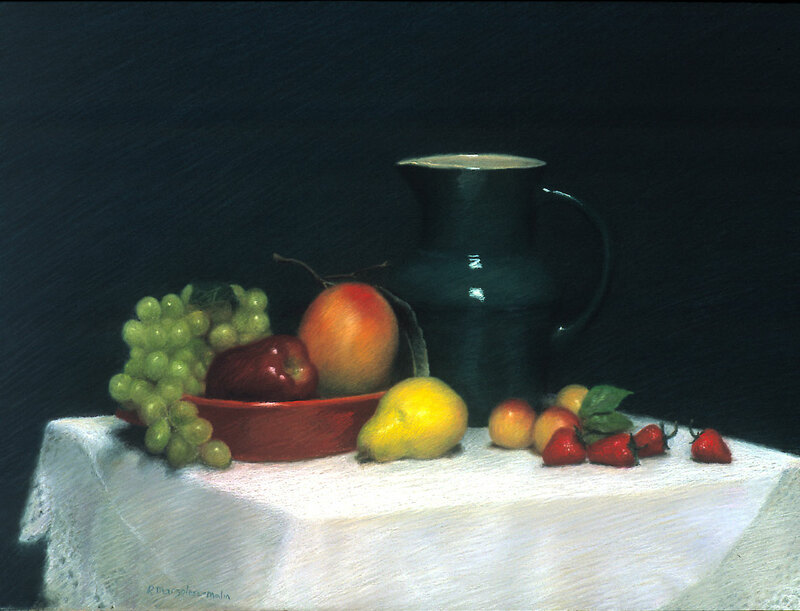 When she was in high school, she was fortunate to have the opportunity to study pastel with Flora Giffuni, founder of the Pastel Society of America. This was Adrian’s true introduction to soft pastels. She loved the immediacy, flexibility, and rich, vibrant colors pastels provided. 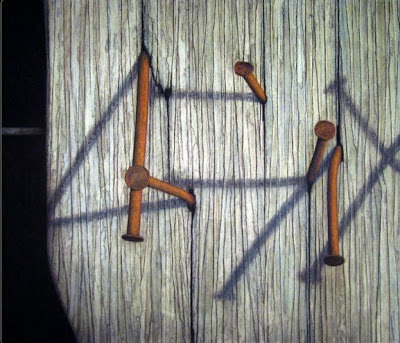 In 1983, Adrian began her studies at the Rhode Island School of Design, where she experimented with many different media. She particularly liked figure drawing and discovered her passion for children's pastel portraiture. Ultimately, she chose pastels and charcoal as her favorite media. Upon graduation from RISD in 1987, Adrian entered children’s book publishing at EP Dutton. She also became a freelance illustrator for children’s readers and workbooks. Eventually, in 1992, Adrian became a children’s book illustrator for Houghton-Mifflin. 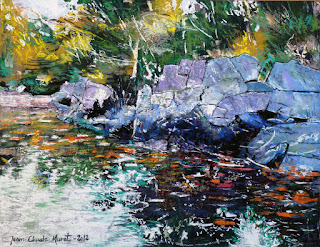 She has been painting for 20 years and exhibiting her work for the past decade. Adrian has had her children’s portraits featured in numerous art exhibitions, including shows at the Children’s Specialized Hospital in Mountainside, NJ and the Diversity Art Gallery. She received acclaim for her artwork in the Westfield Art Association 2005 exhibition. Adrian’s portrait, The Bliss of Childhood, was selected for exhibition in the 34th Annual Open Juried Exhibition for the Pastel Society of America. 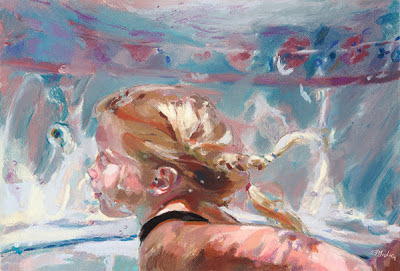 She also was awarded the PSA Award of Excellence for her pastel, Jami Swimming ll, in the 2007 Pastel Society of New Jersey juried exhibition. Adrian's portrait The Ring Bearer was juried into the October 2011 Pastel Society of New Jersey Exhibition. In January 2012, Adrian’s artwork was awarded Special Recognition in the Light, Space & Time Online Gallery in the Painting Category. Adrian's portrait Brothers was awarded Best in Show in the 2012 Scotch Plains-Fanwood Art Association Members' Exhibition. Style: Representational, but loose, painterly approach. These portraits are as far from the twee, saccharine figures one sees too often with children’s portraits as it is possible to go. They are lively, expressive, full of joie de vivre. Navigation: Links remain available at top of page. Image View: Thumbnails at the side open in a viewer and may be viewed singly or played in a slideshow. Dimension is not stated. Download is possible.